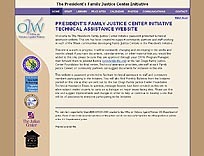 The President's Family Justice Center Initiative was started by President George W. Bush in October 2003 when he designated the San Diego Family Justice Center as the organizational model for domestic violence victim assistance. The federal Office on Violence Against Women funded the Initiative to create 15 such Centers around the United States. Our team created a private website for the PFJCI staff and Centers, in order to encourage cooperation, collaboration, and information sharing. The site includes a calendar that an administrator on their staff changes, a photo gallery also managed by a staff administrator, and a message board for interaction purposes. We were requested to keep the design very spare, since it's a private site. "Mike Atkinson and his uneekNet team do an incredible job. They do excellent work with integrity and professionalism -- no one could ever need more in addressing their Internet needs. I strongly recommend Mike and his team for any business - either a for-profit or non-profit entity. Beyond tremendous competence in implementing any business or strategic plan, Mike also adds an enormous amount of value with his own creative, innovative, and insightful advice and counsel at every step of a project. If Internet consultants were graded, Mike and his team would always get an A+ from me and everyone I else I know that has worked with him!"